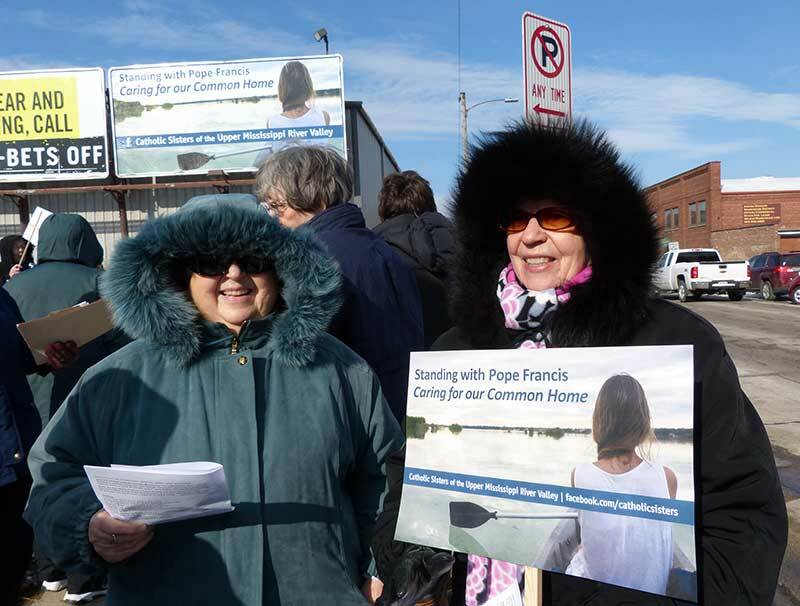 Sinsinawa Dominican Sisters Betty Kugi, OP, and Prioress Mary Ellen Gevelinger, OP, braved the cold Jan. 27 to urge others to care for our Earth at the corner of 8th and White streets in Dubuque, IA. The article follows up on the article, “Catholic Sisters to Promote Care of the Earth through Billboards,” posted on January 13, 2016. DUBUQUE, IA – The eyes of the nation focus on the Iowa Caucuses, which take place in the state on Feb. 1. To capture this interest, the 12 congregations of Catholic Sisters of the Upper Mississippi River Valley have placed more than 20 billboards in strategic locations throughout Iowa, southwest Wisconsin and western Illinois. Reminding all who participate in the caucuses to call for an end to environmentally destructive policies and practices. The billboards, posted in January and into February, carry the message “Standing with Pope Francis; Caring for our Common home.” In his latest encyclical, “Laudato Si,” Pope Francis urgently calls people all over the world to take action to protect the earth, our common home. Among competing political concerns, protection of the earth has not yet risen to the status of a burning issue with the candidates and many voters. The billboards are an effort to call attention to this critical issue. The Catholic Sisters for a Healthy Earth Committee (CSHE), which represents the communities of women religious sponsoring the campaign, initiated the plan for the billboards. “We must care for the Earth and each other by our own actions, by engaging in dialogue with others, and pressing our lawmakers to prioritize bold action to turn the tide for climate justice,” said CSHE committee member Dubuque Presentation Sister Joy Peterson, in a news release. People are also urged to call attention to the humanitarian challenges of climate change with legislators, candidates, at the caucus and throughout the election season. The billboards are placed in the Iowa cities of Bettendorf, Cedar Rapids, Clinton, Davenport, Des Moines and West Des Moines, Dubuque and Sioux City, in the Tri-State areas of Rock Island and Moline, IL and Kieler, WI. “Part of the reason for our billboard campaign is not only to encourage us to talk with our representatives and the candidates about incorporating the environment into our policies, but it’s also that we keep aware, keep moving and discovering all the riches in the encyclical, so we don’t just buy a copy, read it once, put it on the shelf and forget it,” said committee member, Dubuque Franciscan Sister Michelle Balek. Short public common prayer services are being held in each city where the billboards are posted. Dubuque and Davenport held theirs on Wednesday, Jan. 27 with a Des Moines service planned for Sunday, Jan. 31 and Cedar Rapids, Feb. 2. In Dubuque, about 50 sisters, associates and friends carrying placards with the billboard message huddled on this cold windy day near the billboard on 8th and White Streets. The sung refrain of “Sacred the land, sacred the water” by Rufino Zaragoza, OFM carried the theme. The prayer petitions that followed, called for actions needed to halt the practices harming the environment. A few beeps of solidarity and waves from passing lunch hour motorists punctuated the prayer service. “May all who pass by this billboard be moved to work for the good of our common home,” prayed Sister Joy at the conclusion of the service. The response to the billboards has been very positive. “Thank you sisters for living and preaching the call for our planet’s sustainability! Standing with you from Milwaukee,” wrote one commenter on a community’s Facebook page. Catholic Sisters who collaborated on the billboards include the Dominican Sisters of Sinsinawa, WI. ; Benedictine Sisters of Rock Island, IL. ; Sisters of Mercy West Midwest Community; Notre Dame Sisters of the Central Province; Franciscan Sisters of Perpetual Adoration, LaCrosse, WI. ; Sisters of the Humility of Mary, Davenport, IA. ; Sisters United News (SUN); Sisters of St. Francis, Clinton, IA. ; Discalced Carmelites, Eldridge IA. ; Sisters of Charity of the Blessed Virgin Mary, Sisters of the Presentation of the Blessed Virgin Mary, Dubuque Franciscan Sisters, Visitation Sisters and Trappistine Sisters, Dubuque. Sisters United News comprised of communicators from these religious communities created the “Care for our Common Home” message for ads appearing in the USA Today and local diocesan newspapers during the September visit of Pope Francis to the United States. Members of the CSHE committee expanded on that idea as they planned for the pre-caucus billboard campaign. Catholic Sisters who collaborated on both the ads and the billboards have created other Gospel-themed justice issue messages over the past 20 years. A billboard campaign before the 2012 caucus urged people to be part of welcoming communities, to accept and help immigrants searching for safety and better lives for their families. With the current billboard, they want to raise awareness and encourage all to walk more gently on this planet to preserve our Earth for future generations.